Get Your A: Don't forget the milk... Evernote to the rescue! 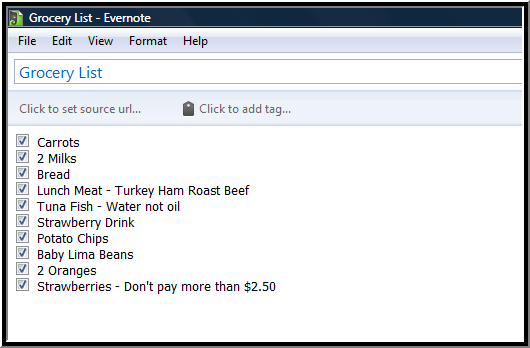 Don't forget the milk... Evernote to the rescue! I've seen lots of posts on how to best use Evernote, but here is one that will make you more productive, save you gas, and keep you out of trouble with your spouse. Who wouldn't want those things? Here is what you need to do. First, create a new notebook in your Evernote account and call it @Shopping. Then select the share button and share your newly created notebook with your spouse. Now you will need to add a new note to your @Shopping notebook and call it Grocery List. Insert a checkbox and enter an item next to the checkbox that you need to get at the grocery. As you think of other items add more checkboxes with the additional items next to them. Have your spouse do the same as he or she thinks of items that you need from the grocery the next time you are there. 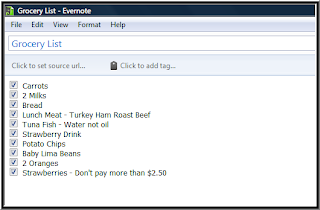 Finally, when you actually go to the grocery, access Evernote using your smart phone. I personally have the Droid 2 and use the Evernote for Android app. Pull up your Grocery List note, and begin picking off the things that are on your list. As you put them in your cart, just check them off. You will get everything that you listed as well as the things that your spouse listed. Above all, you won't forget the milk. There you have it. I told you it was simple. Now add a couple of other shopping lists as notes to your @Shopping notebook, and you'll always be prepared when you are our an about. If it happens to be your spouse that is out and about, they can access the appropriate list from the shared folder and pick up a few things as well. When Evernote syncs both of you will be able to see what the other has picked up at the store because all of the items that were purchased will have their checkbox checked.